Joan Sheen Cunningham remembers life with her uncle, Archbishop Fulton Sheen, who was the face of the American Catholic Church for decades. 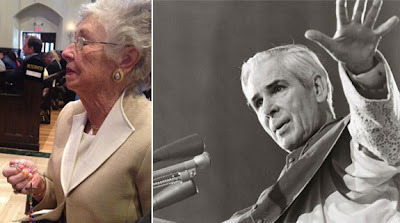 Pope Benedict XVI declared Archbishop Fulton Sheen (1895-1979) “venerable” on June 28, and the Illinois-native could soon become the first male American-born saint. A few generations back he was the face of the Catholic Church in America for many, employing his strong speaking ability, personal piety and learning, and modern media to win many converts to the Catholic faith. For a second there I thought he was YOUR uncle. Unfortunately, not MY uncle, but I did meet him in person once when he said Mass at the National Shrine of the Immaculate Conception on the occasion of his receiving the combined Patronal Medal of the Shrine and The Catholic University of America in 1975. He gave one of the most moving sermons I have ever heard. He was truly one of the great evangelists of all time.